Clark's 1806 Route Captain Clark and his party found great quantities of camas just beginning to bloom when they passed here on Sunday July 6, 1806. As they left the forested mountains trails went in several directions. But Sacajawea knew the area well. She had gathered camas plants here as a child. Clark wrote: "the Indian women wife to Shabono informed me ... when we ascended the higher part of the plain we would discover a gap in the mountains in our direction to the Canoes." The high mountain plain (Big Hole Valley) they were about to enter remains much the same as Clark found it. Wildfire has burned portions of this area, much like 200 years ago. The Columbian ground squirrel, or "whistling squirrel," continues to burrow in the meadows. Caption: (upper left) Map of the battles during the Flight of the Nez Perce. Battle in the Big Hole On August 6th, 1877 an estimated 800 Nez Perce passed this way on their flight to freedom. Many in the group thought they had left the conflict behind. They did not know that Colonel Gibbon was right behind them. Several young men wanted to scout back along the trail, just to be sure. But Chief Looking Glass would not agree. Scouting would violate the trust of their peace agreement with the Bitterroot settlers. "All right, Looking Glass, you are one of the chiefs! I have no wife, no children to be placed fronting the danger that I feel coming to us. Whatever the gains, whatever the loss, it is yours" -- Five Wounds, a Nez Perce warrior who wanted to send scouts back over the trail. August 9th, 1877 the dawn's silence was shattered by the attack of Gibbon's 7th U.S. Infantry and the Bitterroot Volunteers under Captain John B. Catlin. 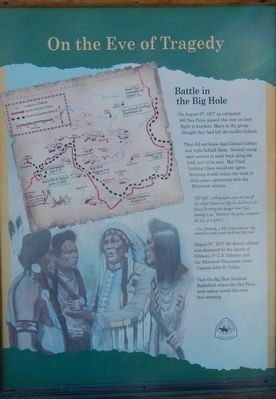 Visit the Big Hole National Battlefield where the Nez Perce were asleep beside the river that morning. Caption: (background) Map of the Lewis & Clark 1805 and Wm. Clark 1806 routes. "La-Im-Tse-La Lik," the name used by the Salish Indians, means "place of the ground squirrel." Trappers called the area "Big Hole," a term meaning "broad, flat, mountain-rimmed valley." 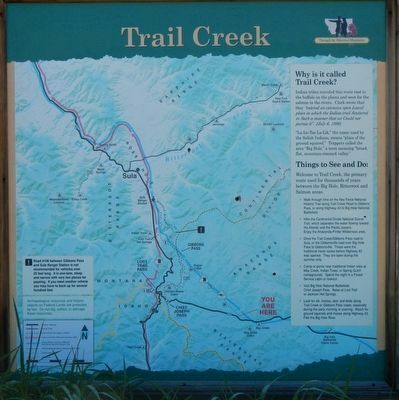 Welcome to Trail Creek, the primary route used for thousands of years between the Big Hole, Bitterroot and Salmon areas. 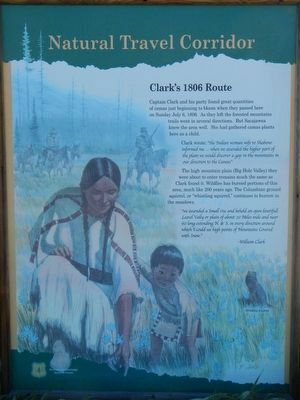 •Walk through time on the Nez Perce Historic Trail along Trail Creek Road to Gibbon Pass, or along Highway 43 to Big Hole National Battlefield. •Hike the Continental Divide National Scenic Trail, which separates the water flowing toward the Atlantic and the Pacific oceans. Enjoy the Anaconda-Pintler Wilderness area. •Drive the Trail Creek/Gibbon Pass road to Sula, or the Gibbonsville road over Big Hole Pass to Gibbonsville. These were the traditional travel routes before Highway 93 was opened. They are open during the summer only. •Camp or picnic near traditional Indian sites at May Creek, Indian Trees, of Spring Gulch campgrounds, Spend the night in a Forest Service cabin or lookout. 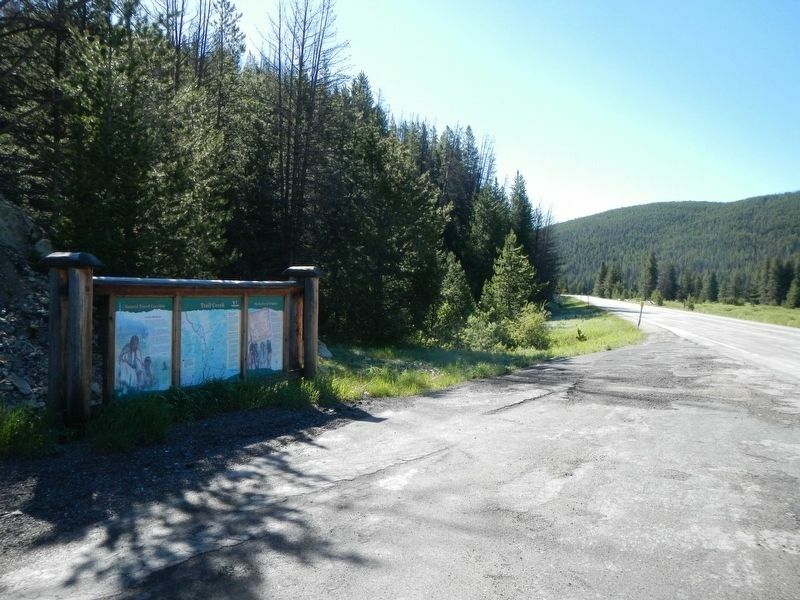 •Visit Big Hole National Battlefield, Chief Joseph Pass. Relax at Lost Trail or Jackson Hot Springs. along Highway 43. Fish the Big Hole River. Erected by U.S. Forest Service, Bitterroot National Forest. Marker series. This marker is included in the Lewis & Clark Expedition, and the The Nez Perce Trail marker series. Location. 45° 39.582′ N, 113° 48.744′ W. Marker is near Wisdom, Montana, in Beaverhead County. Marker is at the intersection of State Highway 43 and Bitterroot-Big Hole Road, on the left when traveling east on State Highway 43. Touch for map. Marker is in this post office area: Wisdom MT 59761, United States of America. Touch for directions. Other nearby markers. At least 8 other markers are within 8 miles of this marker, measured as the crow flies. A Story of Fires... to be continued (approx. 1.6 miles away); Jerry Fahey’s Cutoff (approx. 6.6 miles away in Idaho); Lost Trail Pass (approx. 6.6 miles away in Idaho); Which Way Did Lewis & Clark Go? (approx. 7 miles away); Big Hole National Battlefield Monument (approx. 7.8 miles away); Siege Site (approx. 7.8 miles away); Brave Warriors (approx. 7.8 miles away); A Perfect Place to Rest (approx. 7.8 miles away). Touch for a list and map of all markers in Wisdom. More. Search the internet for Natural Travel Corridor. Credits. This page was last revised on September 24, 2018. This page originally submitted on September 24, 2018, by Barry Swackhamer of San Jose, California. This page has been viewed 59 times since then and 13 times this year. Photos: 1, 2, 3, 4. submitted on September 24, 2018, by Barry Swackhamer of San Jose, California.